No Improvement is a sort-of-funny talk show that explores the vast, untapped potential of TV shows, books, films, and more. Quill & Slate blog runners Thelonia and Tia review—and then reimagine—the stories you know and love until you can barely recognize them anymore. Hopefully in a good way. And if not, well, we hope you are still entertained. 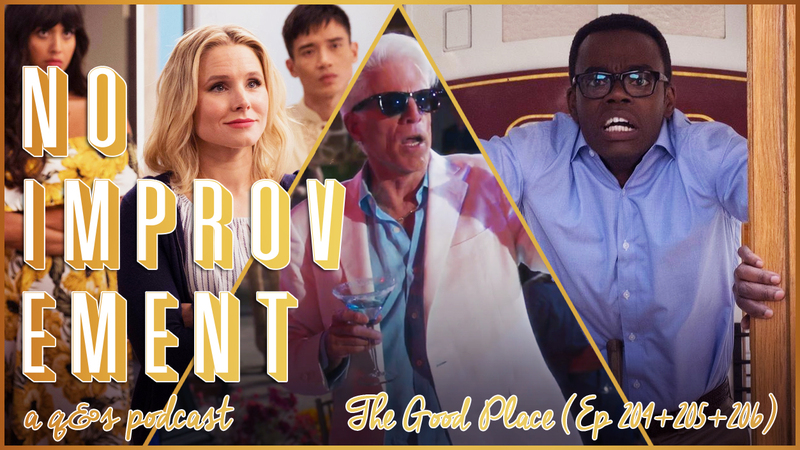 In the 46th episode of No Improvement, we discuss three episodes of season 2 of The Good Place : "Team Cockroach," "Existential Crisis," and "The Trolley Problem." Next week, we will be talking about episodes 7, 8, and 9 of the second season of The Good Place . © 2016-2017 Quill & Slate. Powered by Blogger.